We care for over 25,000 patients from around the world each year. We promote faster recovery with minimally invasive surgery when possible. We use clinical outcomes to continuously improve our service. Four out of five patients recommend Mayfield to their family and friends. 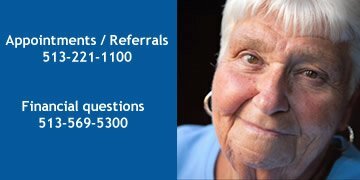 Mayfield's Initial Care Department is available Monday through Friday, 9:00 am to 5:00 pm, to help patients get the treatment they need quickly and efficiently. Learn how to refer yourself or obtain a physician referral to Mayfield. Please select from the list below for details on scheduling an appointment. Call our Initial Care Department at 513-221-1100 or 800-325-7787 to get registered. You will be asked some questions so that we can better guide your care. In addition, you may be asked to provide your complete medical history. We will ask you to provide recent x-rays, MRI/CT scans, or other related test results. Depending on where the testing was done, we may be able to access it digitally. Otherwise, we may ask you to deliver or mail it to us. Once we have all of your diagnostic test results, the surgeon will review your medical information, and we will call you with a recommendation. You may be scheduled for an immediate appointment if your condition is urgent. However, many patients benefit from additional nonsurgical treatment and testing prior to an appointment with a surgeon. The surgeon may recommend that you see one of our rehabilitation physicians, receive physical therapy from our network of therapists, or schedule additional testing such as an MRI. If the physician recommends treatment prior to an appointment, a Care Coordinator will call you to help coordinate your treatment and answer any questions you may have. We will maintain communication with you and your referring physician throughout your care experience to ensure your total satisfaction with Mayfield. You will not incur any out-of-pocket expense for the Priority Consult review. However, if your insurance company is contracted to pay Mayfield Clinic for the surgeon’s review, this payment will be reflected on the Explanation of Benefits (EOB) from your insurance company. This is for your information and is not a bill. If the surgeon recommends an appointment, treatment or procedure with a Mayfield physician, physical therapist, nurse practitioner or physician assistant, then that appointment will be billed to your insurance, and you may incur out-of-pocket expenses. We will ask a few brief questions and schedule your appointment. In some cases, you may be asked to provide a more detailed medical history. We will ask you to provide recent x-rays, MRI/CT scans, or other related test results prior to your appointment. Depending on where the testing was done, we may be able to access it digitally. Otherwise, we may ask you to deliver or mail it to us. If you have been diagnosed with a brain condition, you will benefit from having a multidisciplinary team of experts supporting you and offering the most innovative treatments and clinical trials. You will find those experts at Mayfield. Call our Initial Care Department 513-221-1100 or to schedule an appointment with a neurosurgeon. Depending on your diagnosis, we may conduct a medical history interview over the phone. The physician will review the Priority Consult and develop recommendations. For patients with complex brain lesions or brain tumors, the physician may request a review by our tumor board, a multidisciplinary group of specialists that meets weekly. For others, the physician may order additional testing, schedule an appointment for further examination, or render an opinion. Mayfield Physical Therapy offers onsite physical therapy services at our Green Township, Rookwood and West Chester offices. Our PT staff has more than 22 years of experience and specializes in physical therapy for patients with diseases and disorders of the brain and spine. 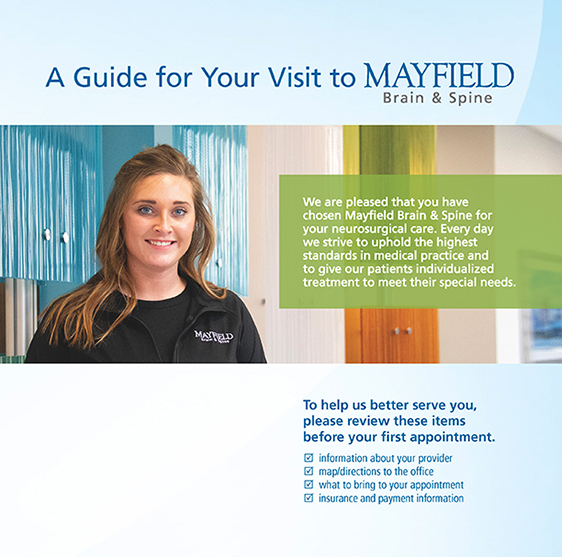 If you are already seeing a Mayfield physician, our office can assist you in making your appointment. Otherwise, call 513-569-5220 during regular business hours, and we will get you scheduled as soon as possible. My Mayfield is our online patient portal where you can receive secure email from the doctor's office, request medication refills, and view your chart summary. You must be registered in our system to obtain a PIN number. Talk to one of our Initial Care Specialists about our online services.